A Tennessee Democrat newly elected to the House of Representatives has apologized for saying the state is racist and most residents who voted Republican are uneducated. London Lamar, who ran uncontested in Tennessee's House District 91, made the remarks in a 15-minute video posted to Facebook after last week's midterm election. 'Tennessee's racist. Period. Period. Like, Tennessee is racist,' Lamar, a black woman, said in the since-deleted video. The video was posted on Wednesday and taken down by Friday, but not before being widely shared and captured in full by local news outlets. Lamar's comments were not well-received by many constituents in the Democrat-leaning district, which includes Memphis. The congresswoman-elect offered a partial apology on Monday, saying: 'We want to make sure we don't over-generalize groups of people,' while maintaining that race played a role in elections across the 'polarized state'. At another point in the video Lamar said: 'White men voted Republican over - well over 60 or 70 percent, so obviously that's a particular base of people who believe in superiority. Later on she comments: 'I also think we need to stop acting like we’re in post-racial America, people. 'We are not. Tennessee is racist. Like these people–I don’t want to say these white people– in Tennessee, have voted against you. And not just a little bit, but a lot of bit. So I think you all need to realize that, who’s your real enemy here?' Lamar asks. 'I think that, as an African-American community, and this is what I’ve been preaching, we need to come up with a policy platform, a concise policy platform that we’re going to push because, right now, this is no different than 1968,' she continued. Rachel Drozinski, a white woman, reacted to the video by telling local station WREG: 'I think that our country, in general, has a long way to go, but you can't make a blanket statement like that. However, the congresswoman-elect doubled-down on the original point she was trying to make: that race played a role in the election. 'What we have seen is that many of the folks who voted Republican based their judgment on racially-charged rhetoric that was coming down from the White House,' Lamar said. Lamar promised to advocate for all constituents in her district regardless of race or party affiliation when she takes office in January. 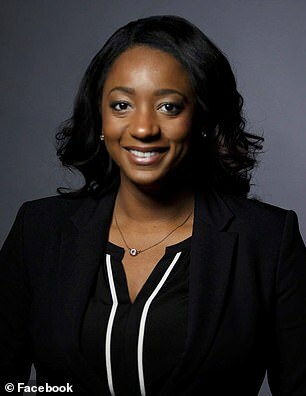 The president of Tennessee Young Democrats defeated Doris DeBerry-Bradshaw and Juliette Eskridge in the Democratic primary on August 2.